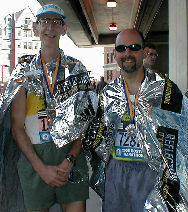 The Rebel Runners were represented at marathons on three consecutive days in April 2005! Sat. 4/16: Ocean City Marathon (MD) saw Sheer Bliss survive the wind. Sun. 4/17: New Jersey Marathon saw Herko and Tony BBQ finish together. Mon. 4/18: Boston Marathon saw Coach and RayChris take on the Newton Hills. Always run facing road traffic! It is your general back from my sabbatical. The tropics were beautiful and yes, I did run while I was away! I had to burn off the calories from all of those umbrella drinks while getting ready for the big race on Sunday. CONGRATS RAYCHRIS AND COACH DAVE ON CONQUERING THE BM (Boston Marathon)! Nice quotes RayChris about the BM in the NewsUrinal. Too bad your mug wasn't in there instead of [others]. I looked for you on tv, but shockingly OLN didn't give much time to those not in the top 5 (i.e., EVERYONE). Can't wait to hear about it on Thurs. Although the Ocean City Marathon (OCM) significantly paled in comparison, Cathy K. (Sheer Bliss) is to be commended for her efforts under quite extreme conditions. As previously mentioned, the wind was exceptionally strong, blowing the runners to the side, especially between 13 and 17 when the race was literally on the island/beach of Assateague. The wind was constant thruout, but the miniscule mile markers were not. That is, the course was not completely marked, and the runners were misled at the outset such that they had to do a small loop at the end with the finish in sight for about a mile. The course was primarily on regular roads not closed to traffic, so yours truly, of course, took over some volunteering duties when there was a dearth of volunteers at key traffic areas (felt like CR). Franny T. jumped in on his bike and just escorted the leader the whole way. Szymanski ran the accompanying 5k (finishing 3rd! )and then joined me in supporting the runners at various spots along the course. Wearing my neon orange volunteering jacket, many people thought I was a race official. (The orange jacket was not so helpful when trying to be subtle while voiding in the woods). One nice thing was I/we were able support Bliss at a number of spots along the course, accompanying her at various times. Franny biked alongside her for probably the last 7-8 miles. Yes, B and I did finish together yesterday. It was a well organized marathon on a flat course. We also where very fortunate to have good weather considering how windy it was the day before and how hot is was 1 mile inland. B did not have any stomach issues this time but stared to feel a little fatigued around mile 18. We walked through all the water stops in the last 6 miles and finished feeling good about the whole experience. We''ll be taking it easy for a couple of weeks but on May 1 we start training for the Twin Cities Marathon. For the third year in a row the Boston Marathon featured temperatures warmer than ideal. Although not as warm as last year(83 degrees at the start), the 70+ at the start was similar to 2003 and very deceptive. The not-outright-hot temperature combined with low humidity and a breeze fooled everyone into feeling they could run close to their goal pace. This strategy worked fine for the first half of the run, but, inevitably, most of the runners succumbed to the effects of getting warm and somewhat dehydrated. By the last miles all but the most well trained were struggled to summon up the energy to finish. Incredibly, 13,000 of the 20,405 registrants were first-timers. Of these registrants, 18,319 started the race and 17,549 finished. So, for anyone doubting their ability because of a slow time, remember that you got past two hurdles. Over 2,000 could not start for some reason, most probably being injuries, and 770 who started could not finish. For the full recap of Ray's race (including plenty of photos), click here. Having just set a new PR in winning the Think First 5K on Thursday in 20:07, K-Drive apparently discovered that running faster makes you faster yet. On Saturday, she was first female overall again at the Visionary Peace 5K in Baltimore. She knocked an incredible 37 seconds off her time to run a 19:30 PR.